Guests attending a reception for the Clemson Tigers grab fast food sandwiches in the State Dining Room of the White House in Washington, Monday, Jan. 14, 2019. President Donald Trump welcomed the NCAA national champion Clemson Tigers football team to the White House Monday with a smorgasbord of fast food offerings he called "great American food," including piles of pizza and fries and more than 300 burgers, NBC News reported. 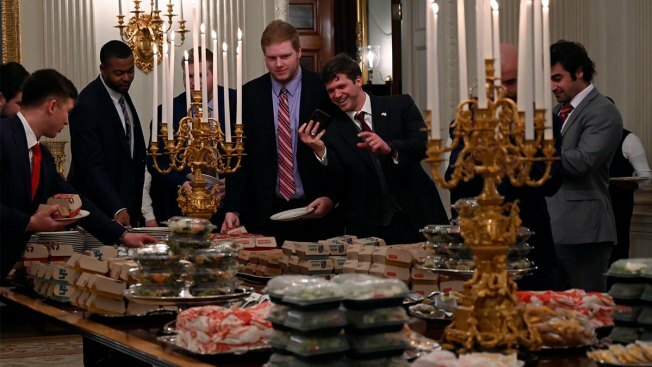 “Because of the shutdown, as you know, we have the great Clemson team with us, so we went out and ordered American fast food paid for by me,” the president said in the East Room, standing behind a table loaded with offerings from McDonald’s, Wendy’s, Burger King and Dominos served on silver platters, behind a gilded candelabra.